Recipe: Boil the spaghetti in two litres of salty water until al dente. While the spaghetti is boiling, in a separate pot, steam the clams in 2 cups of water. When they start opening, take them out one by one as soon as they open. When all the clams have opened, rinse them with cold water and set aside. I do not recommend cooking the clams right in the pan with the sauce, like the mussels, because those creatures live in the mud and no amount of washing can take out all the sand from inside. Once you have the clams ready, heat the butter in a frying pan and saute the garlic and onion until soft, add the clams and deglaze with the white wine. Add the chili flakes, oyster sauce, the juice of 1 lemon wedge and the tomato sauce. Season the sauce to taste and reduce slightly. Remove the clams and set aside in a warm place. Add the boiled spaghetti and toss well. 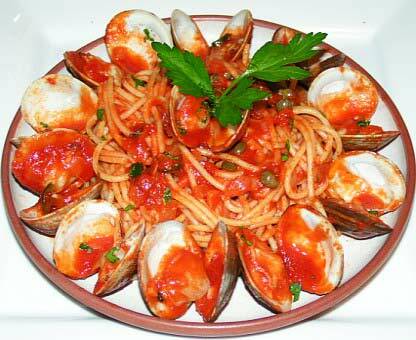 Serve the Spaghetti Vongole as seen in the picture and sprinkle some chopped parsley on top. Cooking tip: You can add some clams from a can to the sauce for a stronger flavor. You should probably rinse the canned clans before adding them to the spaghetti sauce, as the canning liquid is not too good tasting.